Minister Mason speaks at the federal announcement of $168.5 million in funding for the Springbank Off-Stream Reservoir. Reducing the impact of natural disasters such as flooding is critical to keeping Canadian families safe, protecting local businesses and supporting a strong economy and middle class. 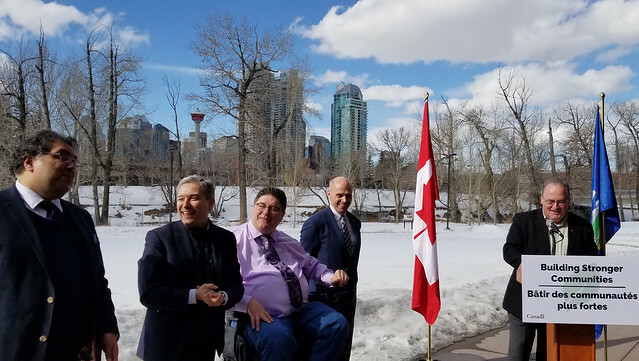 François-Philippe Champagne, federal Minister of Infrastructure and Communities, has announced funding for the Springbank Off-Stream Reservoir project. This project is currently undergoing a federal environmental assessment process led by the Canadian Environmental Assessment Agency and the Aboriginal consultation process is underway. Construction will not start until the Minister of Environment and Climate Change Canada has issued a decision statement and until Canada is satisfied that the legal duty to consult Aboriginal peoples has been met. More than $1.5 billion for the Calgary Green Line Light Rail Transit Project to connect new areas of the city to convenient, accessible transit. Over $29 million for the construction of a new wastewater transmission system to provide residents of Lacombe, Blackfalds and Lacombe County with reliable services.